Semantics and Concepts (7 papers). Cognitive Representation and Language Processing (8 papers). Acquisition Within and Across Languages (5 papers). Social Cognition and Language Communication (5 papers). Metalinguistic Knowledge and Cognitive Functioning (3 papers). Index. How do people represent their knowledge about the world and use that knowledge for communication? This question is the central theme of this book. Among the aspects discussed in the first three sections are: the relationship between formal, logical descriptions of language, and psychological analyses of language use; how knowledge interacts with language use; and childrens' acquisition of language in different countries. 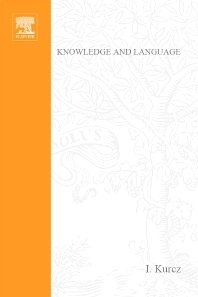 In the last two sections, the topics discussed include the complex relationships between the development, transmission, and comprehension of intention and meaning, the growth of the representation of social knowledge, and the impact acquiring a language (or two languages) has on the development of the child's knowledge structures.